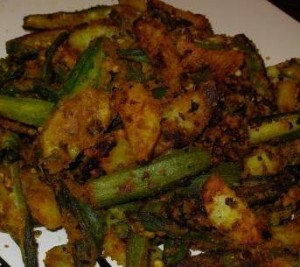 Crispy Fried Bhindi And Aloo In Masala recipe by Nazia at DesiRecipes.com. Fry Bhindi and potato fingers till tender and slightly crispy. Heat oil and fry all Masala. Add in tomato paste, lemon juice and 1/4 cup water and fry masala well and pour on top of fried vegetables. Sprinkle hara masala on top. Serve both in one dish kept side by side.